Most know the Good Samaritan as the hero and moral focus in the well-known Biblical parable. A Jewish man was beaten, robbed and left for dead on the side of a road. Three individuals happened upon the injured man in turn. The first two were of elite Jewish standing and took a wide path around the man so as to not get involved. The third individual was a Samaritan. Samaritans and Jews were considered enemies. Regardless, it was the “enemy” Samaritan, not the other two, who attended to the injured man and arranged for his care, hence the message of mercy in the parable. In Bad Samaritan, I imagine him not stopping — no mercy — I guess, in response to how the world often seems in practice. 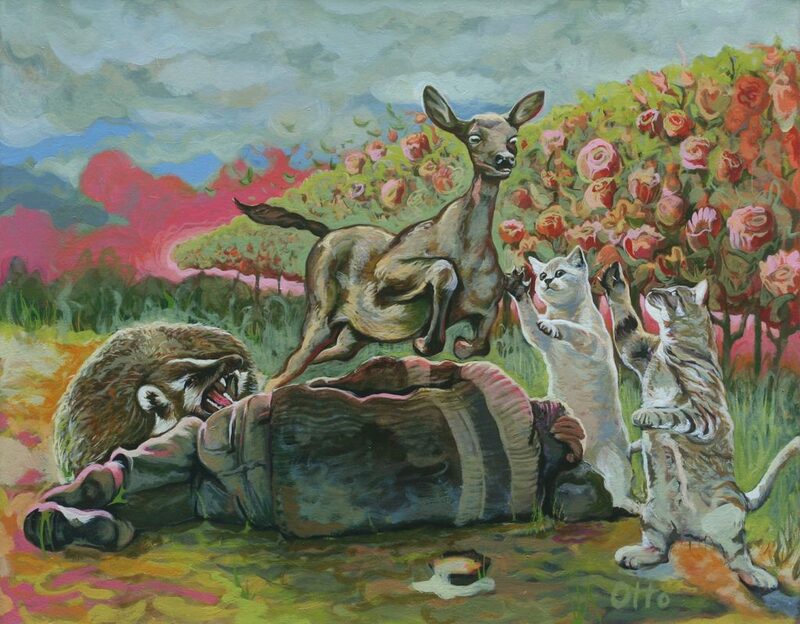 In this work, a badger and two cats try in vain to flag down a deer to help aid a man laying in the road. The deer, however, is oblivious to all but himself.